SPORT: Today we hosted the 2012 Rio 4s. Eight teams of four anglers took to the boats to try and become the 2012 champions and to try to grasp the 1st prize of a £700 Guide Fly Fishing tackle voucher. It has to be said it was far from ideal out there today. There was a stiff bitter wind and even relentless rain seemed wetter than usual. The anglers were really hardy and on the whole they were rewarded with a fish or two. Two fishermen caught four trout today, the first was John Hood who took one from Gull Island and three from Curry’s Cast. John fished a Di3 sweep sinker and two humongous patterns one in sunburst and one in white. John has been so consistent this season and recently made the England team. England has found a good man there. 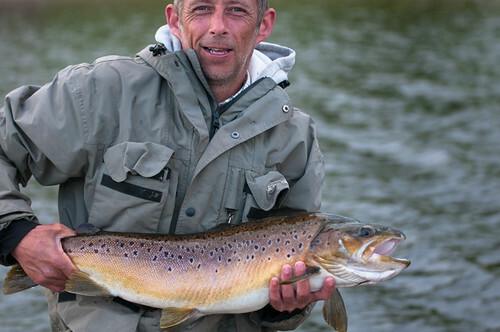 The other angler that caught four trout was another consistent rod in Mark Tyndall. Mark caught his fish from around Gull Island on Dawson’s olive patterns and as his fish tipped the scales a little further he took the top individual position. Jim Pickford took three good fish on Cats whiskers and black n green lures. Andy Cooper caught three trout from Hollins Bay on an orange lure and Gavin Murray also took three fish. The fishing was tough today but the fishermen weren’t helped by the seriously adverse conditions. The Team results down to fourth place are shown below. 3rd Place: The Barracudas: (Pete Scholes, Richard Hood, John Hood and John Sykes) with 6 trout for 12lbs winning a £320 tackle voucher. Ps. Sorry for the lack of photos, we are trying to sort out a glich with the camera. This entry was posted in Stocks Reservoir Fishing Reports on October 28, 2012 by Ben Dobson. A quick update on Stocks: Trout are coming out now from the shore; Tony Taylor took six earlier this week from around Bell Point. Tony has had the best catch this week and he took all of his fish on cormorants fished on a midge tip. There has been plenty of other catches of two’s and threes the best patterns have been: Minkies, Cormorants, Black Fritz, Black n Green Fritz, Black Nomad, Cats and Orange nomad. We have had very few boats out this week but the best areas have been Willow Island, Gull Island, Hollins to Ben’s Beach and Grindy’s Lawn. The last stockings of the season went in last week and today. Those of you in the Rio 4’s on Sunday the match will run from 9:00am – 4:00pm but remember that the clocks go back on Saturday night so we gain an hour sleep. Also it’s worth noting that from Thursday November 1st you can use spinner and worm on fish tickets. This entry was posted in Stocks Reservoir Fishing Reports on October 26, 2012 by Ben Dobson. This entry was posted in Bank House Fishing Reports on October 24, 2012 by Ben Dobson. This entry was posted in Stocks Reservoir Fishing Reports on October 20, 2012 by Ben Dobson. This entry was posted in Stocks Reservoir Fishing Reports on October 14, 2012 by Ben Dobson.